Formaldehyde, a colorless gas with the formula CH2O, is commonly known as dangerous for human health. Important precursor to many other chemical compounds, especially for polymers, formaldehyde is more complicated than many simple carbon compounds because it adopts different forms: it is a gas at room temperature, but the gas readily converts to a variety of derivatives, which are often used in industry in place of the gas. In 2005, annual world production of formaldehyde was estimated to be 23 million tonnes. 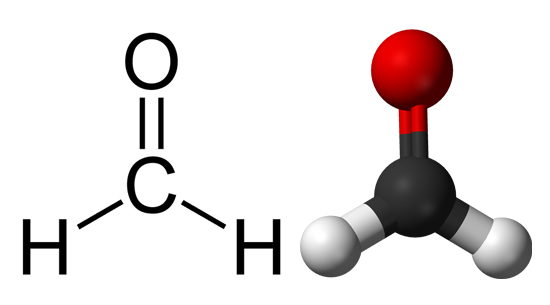 Commercial solutions of formaldehyde in water, commonly called formalin, were formerly used as disinfectants and for preservation of biological specimens. In view of its widespread use, toxicity and volatility, exposure to formaldehyde is a significant consideration for human health. According to the National Institutes of Health the strong-smelling chemical formaldehyde causes cancer as people with higher measures of exposure to formaldehyde are at increased risk for certain types of rare cancers, including those affecting the upper part of the throat behind the nose. The 11th Report on Carcinogens classifies it as “reasonably anticipated to be a human carcinogen” and reported US production at 11.3 billion pounds in 1998. International production was over 46 billion pounds in 2004, according to the International Agency for Research on Cancer (IARC). Formaldehyde is widely used to make resins for household items, including paper product coatings, plastics and textile finishes. It also is commonly used as a preservative in medical laboratories, mortuaries and consumer products including some hair straightening products. Its primary use is in the production of resins and as a chemical intermediate. Urea-formaldehyde (UF) and phenol formaldehyde (PF) resins are used in foam insulations, as adhesives in the production of particle board and plywood, and in the treating of textiles. Is your design user-friendly? Would your consumers suggest it to their friends? When we talk about design we should keep in mind the final user, that is the characteristics and needs of who is going to make use of the product. For example, why doesn’t a new model of chair, beautiful to us, represent a successful product? Probably, because it does not fit the final consumer’s physical, psychological or sociological needs; in other words, it does not consider ergonomics. What is ergonomics and how does it influence the design rules? 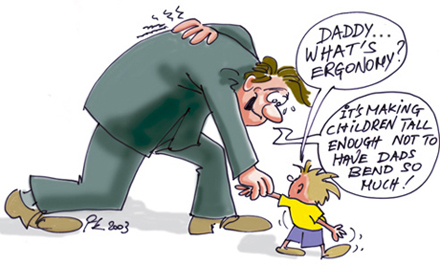 The word ergonomics comes from two Greek words: “ergo”, which means “work”, and “nomos”, which means “laws”. Ergonomics is the science, focused of the characteristics of human fit, that studies the relationship of people with the objects they use and the spaces they live in; in particular, trying to identify the possible solutions to fatigue and discomfort within product design. In fact, when the products fit the people that are using them, in any contexts, the result is high productivity and consumer satisfaction. Ergonomics involves all the production phases, including design, manufacturing and final use. As ergonomics is related to people needs, good designer should be familiar with posture, anthropometry, motion, as well as the space surrounding the design product. There are plenty of differences among people body size and shape, mobility, strength, training, cognition, experience, emotions, and culture. Therefore, the role of ergonomists really play a significant role in the design process, providing knowledge about how to ensure a good fit between people, in the things they do and the products they use, in a specific context. Recognising the importance of ergonomics involves the respect for the human being and is the first step towards a successful design. Entering consumer’s mind is always useful to get the right perspective of a product’s usability and effectiveness. Too often working under pressure or influenced by commercial trends can compromise ergonomics principles; but in the last few years, user-friendly design and usability have become buzz-words together with eco-friendly. Creativity matches with ergonomics, innovation with people needs. Considering now the kitchen product, the need to have everything on hand and to move freely and tirelessly is often not satisfied because furniture is rarely designed to meet the physical features of each user. When buying a product it is important to find out about the aspects that allow you to make a rational choice in order to avoid working in a kitchen in which getting into uncomfortable positions that are harmful for your health becomes inevitable. When the authentic needs and priority are identified, kitchens are eco and user-friendly. Attention to functionality and respect for health. Give a look at Valcucine’s customised kitchen in which technical aspects adapt perfectly to those who use them, like a tailor-made garment made-to-measure on the purchaser. Or discover how we have pursued and constantly pursue ideas that reduce or completely cancel the toxic emissions of furniture in domestic environments.